One Darien restaurant received a “C” rating — the worst in the town A-B-C ratings system — in the most recently released town Health Department inspection reports. Seven other health inspection reports were released on Thursday by the department. Five of the establishments inspected received “A” ratings; two others each got a “B.” The inspections took place from Sept. 7 to 11. 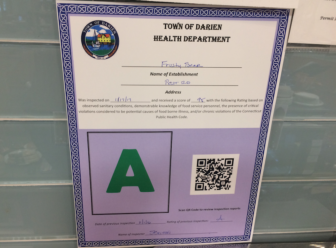 Town Health Department ratings certificates are supposed to be displayed prominently, like this one at the Frosty Bear Cafe at Darien Library. Here’s an alphabetical list of the most recently released health inspection results (an explanation for each part of the list, including links, is just below the list). This inspection report information is included NOT because the Darien Senior Center received a bad rating or score (both were quite good), but because it’s a public institution of added interest. Inspector comments and remarks section of the Sept. 7 inspection at The Water\’s Edge at Giovanni\’s. Dates link to the food establishment’s inspection report referenced here (when available, sometimes it takes a while to get posted online), and Darien’s own A/B/C ratings link to a Web page showing several of the restaurant’s recent inspection ratings. For restaurants and other food-serving establishments rated “C,” and for some others of interest to the public (like schools) additional information is given. When we provide that information here, then words within brackets (“[ ]”) have been added for clarity by Darienite.com; semicolons (“;”) separate individual comments by the inspectors. Each comment separated by semicolons is about a particular violation that triggers a deduction of one or more points from a perfect state score of 100. You can find the past several inspection ratings under the Darien ratings system for food-serving establishments along with copies of inspection reports, including state health code scores on this website. 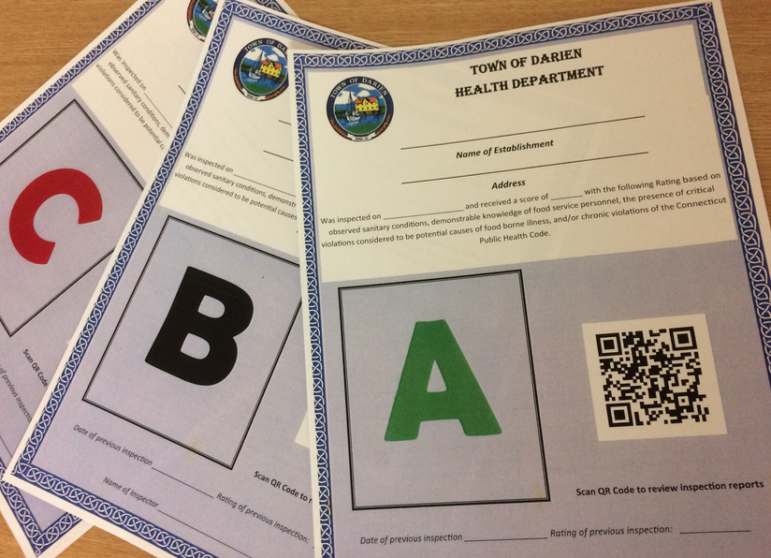 Restaurants in town are rated under the Darien Health Department’s own A/B/C ratings system. Health inspectors also use the state health code regulations to score restaurants, with a perfect score set at 100, and demerits (of 1 to 4 points each) for various code violations. Sign up for the Darienite.com newsletter. The Darien system takes into account problems that are ongoing, so a restaurant scoring higher than others on the state scale may actually get a lower score on the Darien scale. The “A”, “B” and “C” letter grades a restaurant gets in its last inspection will be prominent on these certificates, which must be posted where customers can see them, and you can use your phone and the “QR” code to the right of the letter grade to get to the department’s ratings website for more information. Any establishment actually deemed unsafe can be closed by the town Health Department until violations are fixed. Town Health Director David Knauf says that has never happened in the time he’s been with the department. As their fellow union members did across southern New England, at 1 p.m., employees at the two Stop & Shop supermarkets in Darien went on strike, primarily for better health and retirement benefits. Negotiations with the company hadn't resulted in progress, the employees at the Heights Road supermarket said. SADD (Students Against Destructive Decisions), along with the Darien Police Association, will host a Community Health Awareness Fair, Sunday, April 28 from 11 a.m. to 2 p.m. For the kids, there will be a bouncy house, craft tables (including make your own slime), face painting and free handouts. Dance on the DL in the house with HIP-HOP! Ratings of "C," the worst in the town's A-B-C ratings system, went to two town restaurant in the five food health inspection reports released Thursday by Darien Health Department. 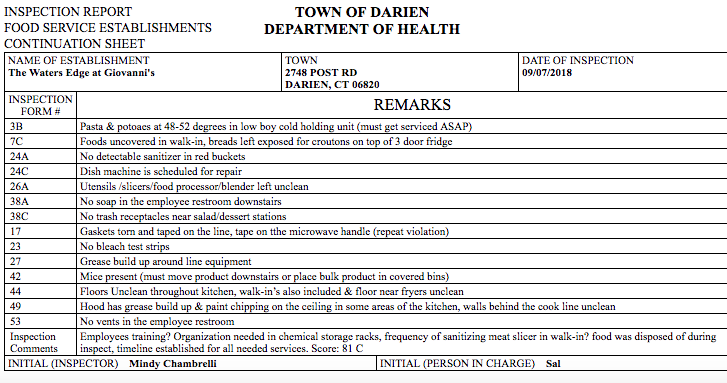 The most recent batch of reports are from inspections that took place from Feb.
A 'C' rating — the worst in the town's A-B-C ratings system — went to one Darien food-serving establishment in the six food health inspection reports released on Thursday by Darien Health Department. Inspection reports from three town schools were among the ones released.